The global wine identity, as defined by the European Vitis vinifera, has been upset by New World players, but the rules of the game are still set by the Old World. Most wine growing regions in the U.S. have been eager to embrace an Old World identity rather than blaze a New World one. American grown Vitis vinifera can produce excellent wines that strive to emulate their European counterparts while also expressing their individual terroir: California Cabernet, Central Coast Grenache and Syrah, Oregon Pinot Noir, and New York Riesling are just some examples. 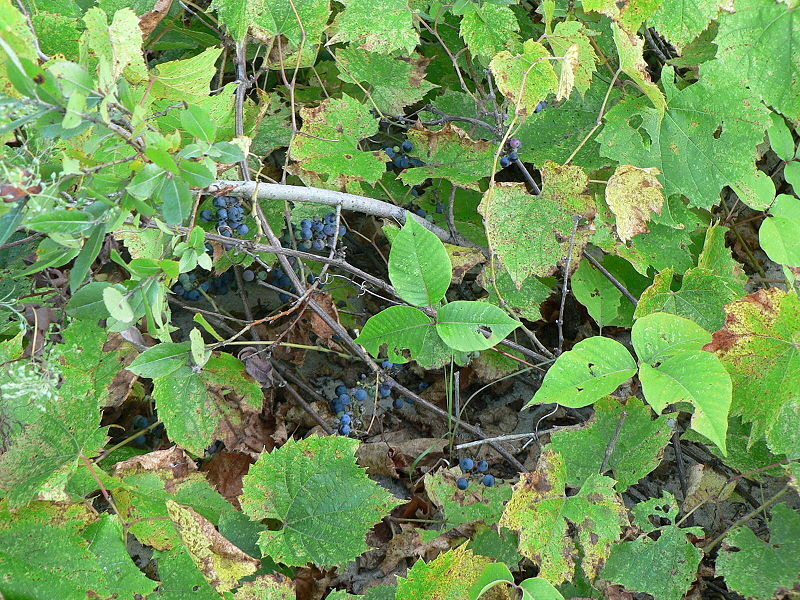 But America has an abundance of native grapes—six different species. If the United States wishes to continue to differentiate themselves on the global wine stage, more attention must be focused on developing these New World vines, and soon. A rich genetic database still waits for the most part to be unleashed. The first man to become widely known for his work on collecting and documenting indigenous American grapes was Thomas Volney Munson. Moving to Texas in 1876 he became best known as the man that saved Europe’s Vitis vinferia from phylloxera through his work developing resistant American rootstock. In 1909, four years before his death, Munson published Foundations of American Grape Culture, the book that ultimately became the foundation for American wine identity. In more recent history, grape breeder Elmer Swenson has carried on the work Munson began, crediting him as an early inspiration. Before his own death in 2004 Swenson had succeeded in revolutionizing grape growing for the colder, short-season regions in the United States. He worked tirelessly cross-breeding Old World Vitis vinifera with mostly Vitis riparia, an indigenous American grape species well adapted to the cold, Midwestern climate. Some of his best known cultivars include St. Croix, St. Pepin, and Swenson Red. His work with the University of Minnesota has been carried on independently leading to significant results such as the 1996 release of the Frontenac cultivar, which has rapidly become the most commonly planted wine grape in Minnesota. The work of these men has been continued by a handful of dedicated grape breeders including Bruce Reisch of Cornell University and Lon Rombough living in Oregon. 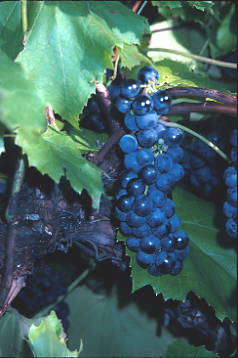 From Rombough’s website (bunchgrapes.com), individuals can order over 100 different varieties of grapes, most of which are either natives or hybrids. Unfortunately, many vintners and winemakers in the U.S. are dangerously ignoring the work of these breeders. Vitis vinifera is the only wine grape species to grow in Europe. Six species grow in North America: riparia, rupestris, muscadine (rotundifolia), mustangensis, labrusca, and aestivalis. While mustangensis will most likely prove worthless for wine production, each of the other five have already been used in French-American hybrids (with vinifera), as well as inter-specific hybrids, to produce hundreds of cultivars. Certainly it should be noted that each of these species presents unique difficulties for use in the wine industry, but each species offers potential as well. At the most basic level, incorporating native grape characteristics into an American wine identity has already been universally done. Munson began this work by developing a rootstock that has spread native American Vitis DNA around the world, but these vines are all functionally Vitis vinifera grafted onto hardy and resistant rootstock. 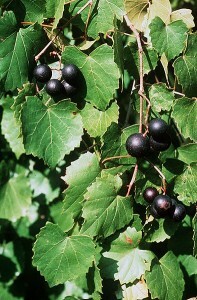 To this effect American Vitis species have been contained to the role of pack mules. They do the dirty work without sharing in the fruit of their own labor. Beyond this, many French-American hybrid varieties are beginning to gain traction in colder climates and regions such as much of the Midwest, New York, and the Rocky Mountains. But these efforts have done little to bring a true American wine identity into focus. If the general problem has been ignoring the grapes beneath our feet, the secondary problem has been that the only attention we have given to indigenous American species has been in an effort to expand grape production into fringe regions—places too cold or hot for classic vinifera. Recently, even in colder regions, new and improved vinifera has begun competing for vineyard space that used to be suitable only for hardy hybrids. This most recent trend seems to be proof that the overall attitude even among many Vitis breeders is one of mimicking European vinifera while merely borrowing helpful survival characteristics from the American side of the family. While it is happening in small amounts, far too little effort is being put into cultivating native American varieties to stand on their own. Most of this work so far has been focused in the warm, humid regions of the Southwestern United States that don’t match well with Old World Vitis vinifera. Almost nothing is being done to evaluate the potential of American species in the key grape growing regions, and there will be no true manifestation or demonstration of an American wine identity until truly American grapes are given our best efforts, best lands and best minds. The commercial problem with developing an American wine identity is that most people have never heard of a Frontenac or a Muscadine, much less know how to match one with a steak or penne pasta. This very real commercial hurdle most likely explains much of the hesitancy to delve into native species. For this reason it will probably take much more time to continue developing the micro-wine market for hybrids and natives. The effort could be given muscle if a large wine conglomerate or powerful winemakers were to sign on and lend credibility to what has, so far, been restricted to the shadows. On the other hand, what we may need are a handful of brave and slightly naïve vintners and winemakers looking for the next Judgment of Paris, when an impossibly outmatched indigenous hybrid defeats in a blind competition a proud, but aging vinifera champion. Bunchgrapes is a great place to find native and hybrid vines, but be aware that these are cuttings and not rooted vines. The University of Minnesota hosts a webpage with a list of licensed nurseries who sell cultivars produced by the University. Many of these suppliers sell Swenson’s top cultivars as well. The Winemaking Home Page is a great resource for those wanting to run a backyard operation. For those wanting to dive in somewhat deeper, the Grapebreeder’s Home Page is the place to go. For descriptions on great cultivars coming out of Cornell University check out their grape breeding program. Check out Floridagrapes for the best source of information on grapebreeding in the South and tons of great links. Ison’s is a great nursery if you are looking for Muscadine. Excellent post. A real step forward. The inclusion of Jack Keller’s website seals the deal for me! This is all quite nice, but no matter the patriotic sway, the consumer has the final say, and when Native N.American varietals do not have a flavor profile preferred by consumers, then they will continue to be nothing more than interestingly quirky quaffs for the overzealous oenophile. C. Lawrence’s comment is correct as far as it goes. But since most of the wine business has no interest in letting consumers taste what else exists, how will they know what they like? Its fixation with cabernet, merlot and chardonnay prevents consumers from even knowing anything else exists. 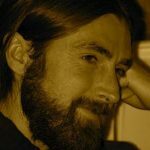 Nice post and thank you! Glad to know that other folks are also doing the uphill work of touting these hybrid varietals. There are a lot of great resources out there among the various state’s cold climate viticulture organizations and university extensions. It would be great to see more mainstream coverage (hint,hint, PP) of both the varietals themselves, and successful commercial vinifications of them. Things are really starting to get interesting here in VT and the Champlain Valley. We just got back from another quick trip through Quebec wine country, and found some more interesting developments and changes in that neighborhood. We are getting ready to bottle a Vignoles / NY 76 blend (from the Cornell test vineyard in Willsboro, NY) tht has turned out far better than I had hoped given the poor ripening conditions last year. Huge boquet of white flowers, bosc pear skin, and even a little spice…a spontaneous and slow ML knocked back the high levels of malic acid that these grapes have relative to the tartaric, and rounded out the mouthfeel. Bone dry and a little tart, beautiful with food…I have to disagree with C. Lawrence, as we have folks who barely drink wine becoming interested, because of these particular wines, not NZSB or CA Chard. The aromatic and flavor profiles of a number of these grapes have significant overlaps with the likes of Austrian whites, Pinot Grigios from the Alto Adige, and other cool climate vinifera. Our 2008 La Crescent fell somewhere between an suavignon blanc and pinot blanc…or at least that’s what blind tasters were guessing at. Given the interest in the local food movement, local wine development has only to benefit from it. THanks Todd, for the great comment. I am glad to hear that you are having success in VT. It is a world away from me here in Utah. And I hope you are right about the local movement helping to boost native wines. Good luck with your vines as well…those Frontenac and St. Croix can both produce massive crops so you’ll want to keep that under control, but that said, it is a good combo to work with. Just had a 75% Frontanac / 25% Sabrevois up in Quebec that is made at winery under new ownership…an Italian family. It was the first time I was seriously surprised at a northern red…they had their oak program completely dialed in, and it absolutlely made me think of the Piedmont. I look forward to future communications.